Caption slip reads: "Photographer: Richardson. Date: 1954-08-30. Reporter: Swaim. Assignment: Air race queen. 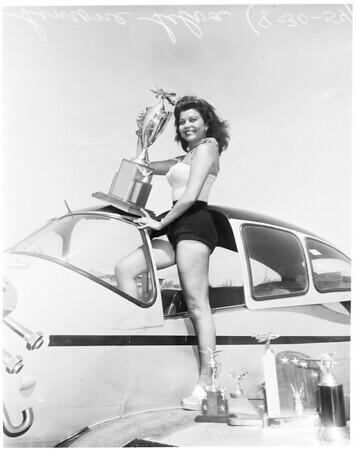 Simone Silva (remember Mitchum) posing on wing of plane with trophy she will present to winner of 1st annual Nim Long Memorial trophy race. As queen of race, she will be flown to Tucson and back in this plane. Simone Silva cooling off with behind prop of plane which will fly her as queen of 1st annual Jim Long Memorial Trophy Race. Pilot is Al Brophy, who will fly Simone to Tucson and back".